Nissin's monster MG10 was unleashed at The Photography Show. Packing an eye-watering maximum guide number of 80 this is probably the most powerful battery powered flashgun that money can buy. Originally announced last year, the flashgun achieves this power by using a hammerhead design, which once used to be more popular on flash units. Instead of sitting on the hotshoe, the gun is supported on a bracket, with the strobe head on top of a column that houses the batteries. An advantage of the hammerhead design is that that flashgun provides a useful grip to be able to hold the set-up steadily. The bracket can be placed at either side of the camera. 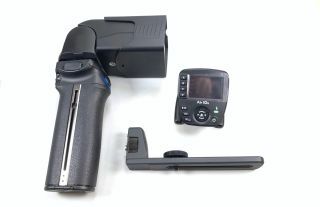 The flash can also be used without any connecting wires - and used completely detached from the camera - thanks to NAS system support with compatible Nissin Air10s and Air 1 wifi commanders. The motorised zoom head offers a built-in range to cover from 24 to 200mm zoom settings, with an flash diffuser attachment offering 18mm coverage. Removing the zoom head allows you to access a 9W modelling light, to help arrange strobist set-ups with ease. The recycling time can be as short as 1.5 secs at full power, thanks to compatibility with Nissin's optional PS8 external power pack. The unit supports high speed synchronisation and traditional optical wireless TTL modes. A microSD card slot on the unit can be used to access feature upgrades via an firmware update. The Nissin MG10 retails at £569 / $599.99. The hammerhead flash is also available in a kit with an Air 10s commander (for a variety of camera systems) for around £635 / $699.99.